Founded in 1992, TeamSport has grown into the UK's largest operator of go-kart tracks and the second largest globally. In 2013, the company completed a £10m management buyout led by Dominic Gaynor and backed by Connection Capital. Since the buyout, TeamSport has achieved impressive growth through a combination of like-for-like sales improvement, new site openings and enhanced performance from acquired tracks. Dominic Gaynor, CEO of TeamSport, commented: "GCA Altium ran a highly efficient and effective process. They invested time up front with the management team to properly prepare the business and then used their considerable experience and sector expertise to guide us through the sale process. The team at GCA Altium were diligent, attentive and senior-led throughout and delivered a fantastic outcome for the shareholders of Teamsport." Christopher Jones, Managing Director at GCA Altium, said: "It has been a pleasure to advise the management and shareholders of TeamSport on this transaction. TeamSport has built a formidable competitive advantage in the karting sector and is positioned to capitalise on the sustained shift in consumer spending towards experiential leisure. 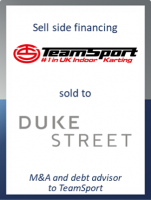 We have little doubt that TeamSport will continue to thrive under Duke Street’s stewardship and look forward to following their success."